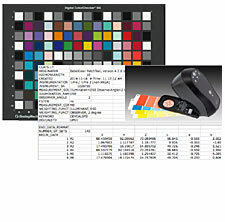 Image Science Associates: X-Rite ColorChecker Digital SG – Calibrated with One Re-calib. X-Rite ColorChecker Digital SG – Calibrated with One Re-calib. Guarantee color success. Don’t rely on generic color target reference data for your critical color profiling. Paint formulation changes of these popular targets are often different from generic reference data. This is especially true for the gray/neutral patches, the foundation of all good color profiling. Each of our X-Rite ColorChecker Digital SG targets comes with a unique target specific certified reference file (spectral and colorimetric) in a standardized CGATS format suitable for use in popular color profiling software tools. We measure each of these with NIST traceable instrumentation that is recalibrated on a yearly basis. A copy of the calibration certificate is provided with each target. Five replicate measures of each target are averaged into the final delivered reference. One re-certification measurement comes with the purchase of each target. Upon notice we will send a pre-paid postage label to the user allowing them to send the target back to us for re-measurement.